The new 2014 Chevy Spark Electric will be the only affordable EV that can accelerate to 60 mph in under 8 seconds. There is a new car war underway and the two players are Ford and General Motors. Ford took aim squarely at Nissan and Toyota with its C-Max line of automobiles and it is currently “kicking and taking” at dealerships. General Motors set out to build an EV with zero range anxiety and zero need for local charging stations and it succeeded with the Volt beyond its plans. Finally one of these two behemoths, and the last two American car companies standing, has taken on the world by designing an affordable electric car with acceleration that is hard to call slow. 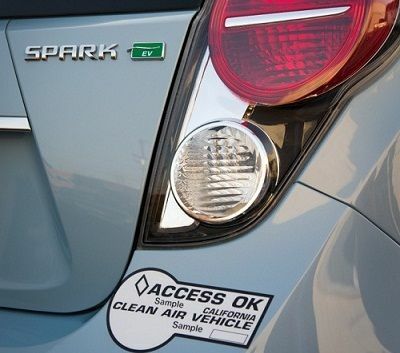 In a press release today GM announced that the 2014 Chevy Spark EV will be as quick to 60 mph as most typical cars. Mark Reuss, president, General Motors North America threw down the gauntlet sating “When you engineer a technology-filled, all-electric mini car that goes from zero-to-60 mph in less than eight seconds, customers won’t miss the gas. 11+ Seconds = Dangerous. Hard to merge. Vehicle must be driven differently than a typical car. Like a motor home, or a big rig. 10 Seconds = The slowest a gas car usually is. Still faster than almost all electric cars ever built. 9+ Seconds = Slow and boring. Coming close to acceptable, but this is your grandmother’s car. 8 Seconds = Typical 4 cylinder family or commuter car. This is also the acceptable benchmark for a decent sport utility vehicle (Like a Highlander or similar). Here is where the new Spark will land. Under 7 seconds – Nearing sporty. Mazda Miata is a 6.5 second car. Here is where the new Toyabaru twins, the FR-S and BRZ play. Under 4 seconds = Exclusive. Corvette, Camaro ZL-1 territory. In addition to building the fastest to 60 mph EV ever, if one excludes the Tesla and Fisker electric toys for millionaires, Chevy is also going to allow this car to be charged to the 80% level in under 20 minutes. Another car company recently announced that it had developed advanced technology that would allow a 30 minute recharge time – and Torque News made fun of the company and its announcement. That this car, under $ 25,000 after your neighbors pay their share via your tax credit, can do all this is the equivalent of putting a man on the moon. It has taken a long time to get to this point. The press release did have some reminders that years from now we all look back and laugh at the state of EVs today. The energy storage unit (battery pack) weighs well over 560 pounds and we can assure you they are not counting the heavy metal box those go into. By comparison the energy storage unit of a gasoline powered car weighs about 90 pounds when full. In order to push that huge, fat, obese, boat anchor of a battery pack the Chevy Spark EV has to generate 400 foot-pounds of torque. That is so much torque it would be welcome by any muscle car owner. In effect this car is a giant lever which slingshots the car from a standstill. Its actual power is very low, particularly for its weight. Both Ford and Chevy have done an amazing amount of engineering and design to get the EV market to this point and they deserve credit where it is due.